A couple of days later and back on the park lake, fishing apparently had got a little tougher owing to two clear nights prior to my next trip and my brother Richard joined me for a couple of hours on the bank, with a fairly brisk wind I found stalking the carp tricky and having stuck to the task for about thirty minutes I finally caved in and dropped two rigs out over a sprinkling of chopped boilies. We decided to plot up together and have a little catch-up, little did we know that after half an hour or so Rikki' right hand rod would melt off! It seemed like a good fish too as I readied my camera to get some action shots, no sooner did I finally get my camera out the bag his middle rod then started to scream off!...all happening then! I plonked the camera down and leant into the other rod. The one I was connected to didn't feel special so I allowed it very little by way of line and within a couple of minutes number one was in, bearing in mind Rikki was still playing his! taking his time is an understatement but he did finally get there and a pristine pair of common carp took a breather in the net before we weighed and photographed them. Top: 23lb 1oz and Bottom 15lb 9oz. Not bad bro! For me the only action was that experienced on my brother rod, my two rods remained motionless before we both called time on it. The Spring of Carping: Part 1, Hitting the Ground Running. To begin the carp campaign I started on a fairly local park lake and for probably the next couple of months I will visit this water on and off, the target? a couple of thirty pound plus mirrors and at least one common carp up that way are present and I look forward to making their acquaintance along with a good head of twenties and a few stunners thrown in too. Conditions on the 26th of March were clear and sunny, however, unseasonably we had tempts of 14-17c for possibly four days which led into that weekend. The water temperature was taken upon my arrival and at 8.7c it was slightly warmer than I expected, with this unexpected combination I hoped a fish was on the cards and one of the reasons I have chosen this lake to do a bit of fishing is; one it also holds Tench, unfortunately numbers and sizes aren't well documented so as the water temp' approaches 11/12c I will look to step up my baiting up for them; secondly, a handful of the carp in this lake are awesome, something wouldn't expect from the backdrop. I arrived at the lake with a few hours spare to see what I could do. A quick lap of the lake to see if any fish were showing in the upper layers (barometric pressure was sat at 1027 and rising throughout the day) and whether any of the six anglers already on had had any joy. One carp at dawn to one angler and the others all pondering whether to stay or not, filled with confidence! Left, a spinner/ronnie rig, Top right, the stiff hinged section. 15lb) and a small pop-up (My choice is a 15mm white pop-up) then critically balanced with rig putty to a supple coated braid hook length. Obviously everyone is different and other combinations may work for others. The other set up was a "Ronnie Rig", why the name? I don't think anyone is entirely sure but it is also known as the "Spinner Rig" which is a devastating way of presenting a bait, especially if there is a thin layer of lake bed weed, like here it keeps the bait popped up just a inch off the bottom and most importantly just above the weed to make it more visible to passing fish. Slacks line and ready for action. Within half an hour my right rod pulled up tight and the tip started to knock violently to the side and line started to peel off the slack clutch. Fished just off the marginal shelf I hoped this rod would pick up an enquiry, not as quickly as that it has to be said. A healthy scrap was played out in front of me before slipping a dark mirror over the cord, first blood. I hoped that would! With trying out new tactics you always fear that it'll take time to all fall into place. At 16lb 6oz it is one of the lakes smaller residents but a pretty one and in good nick too. Pleased with that. Having caught on that rig I felt more confident so to get it fishing again I re-curved the stiff link so the hook would turn at the very slightest of touches, no need to strike on this rig! Half past three came and went with nothing more than a couple of single bleeps, possibly crayfish buggering around with the bait or knocking my rig as they gorged on the 15mm half boilies I dropped out around my bait. Now typically these sort of rigs are used as searching rigs, once feeding fish have established themselves on the spot I would look to change rig and go hard on the bottom, the fact that the fish activity appeared to be sparse almost forced me to remain fishing the way I started. Just a couple of minutes later my left hand rod burst into life as the line pulled up tight quickly and my bobbin smashed the Delkim, fish on! At fifty yards out a large swirl broke the surface as I leant into it. A classic battle ensued as we played an even battle at distance, after a good showing I finally won and a scaley mirror lye resting up, first twenty of the spring. Thoroughly pleased with that, 20lb 5oz and my first twenty of the season, happy boy and very timely as I had to be gone by 4pm, after pics and release there were just a few minutes to get myself away. My 2018/19 season was certainly my least intense for as long as I can remember. That said I had plenty of great trips in good company and on solo missions primarily in search of carp to achieve my challenge that I set myself back in April last year which is the point the new season for me starts. April: I set out early doors on the Tench in the vein hope of finding some good fish with a view of revisting in late May, the ultimate thinking behind that being a double figure specimen is on my wanted list. 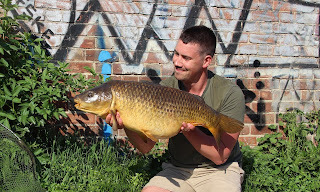 Apart from the Tench, Carp took centre stage as I looked to get hunting down an elusive canal beast which in just a couple of attempts I achieved, albeit not a thirty these were almost of the same calibre simply for reasons that those who fish these canals will only know. A great afternoon on the towpath. 25.7 and my best to that date. May: Carp were still very much in my focus and with the weather improving the fishing improved too. Plenty of carp made it to the net with these two being the pick of the bunch. Also a trip out to Tenerife on holiday with the mrs gave me a great opportunity to target a Marlin but with it still early season I didn't manage to achieve that goal but I will try again. 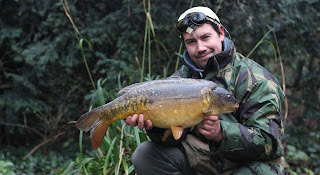 , But these cracking carp couldn't be left out, one of which was an awesome canal warrior. 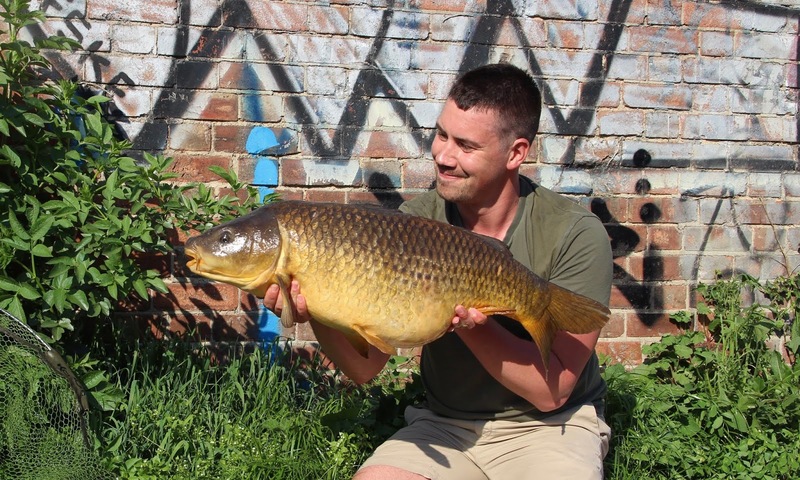 June: Now this always seems to be a busy month in terms of work, birthdays etc so I was pleased to get out a little and with that time I made my efforts count as I tracked and captured my largest canal carp yet at a staggering 27lb 9oz! Along with that were more carp, a 31.10 mirror, TWO!! personal best Bream off of a river! which weighed 11lb 15oz and 12lb 7oz! and a few river carp to make sure that my challenge was taking off in all directions. What A Month June was! and that was only what happened in England. 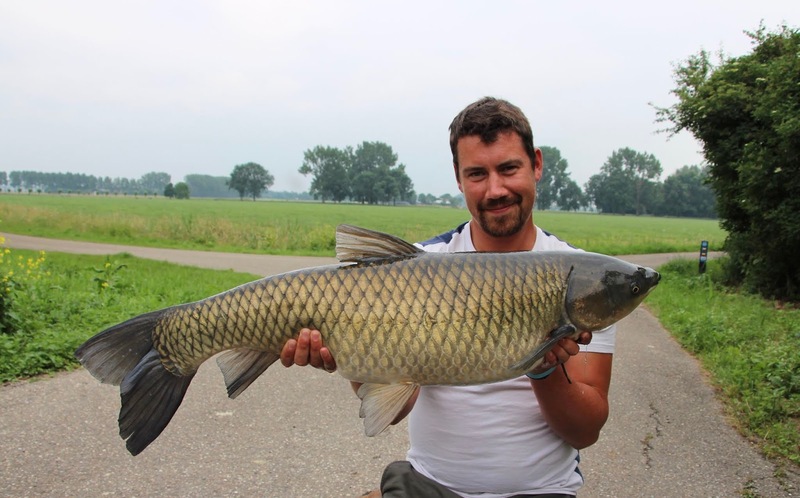 I also spent four days in the Netherlands in search of grass carp and I was to be spoilt rotten by the sport provided. 9 grass carp to 24lb 4oz, mirror carp to mid-doubles, my first ever Ide at 3lb 9ozs and a new PB Asp at a little over 4lb. What A Month indeed!!! PB at 24lb+, from Holland with much love! 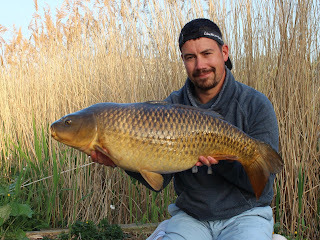 My best river carp of the season as it turned out, two ounces shy of 20lb. July: June was so good I knew it would be a tough act to follow, over that month I managed carp off of three different rivers with the best just over 17lb and 23lb+ from stillwaters, although I tried hard my attempts to tempt one of the biggest river carp I had ever seen were dashed, a ten minute battle became a stalemate and after much head scratching and endeavour I finally lost what can only be described as a true river giant, my chance of a river thirty slipped away right there and then. 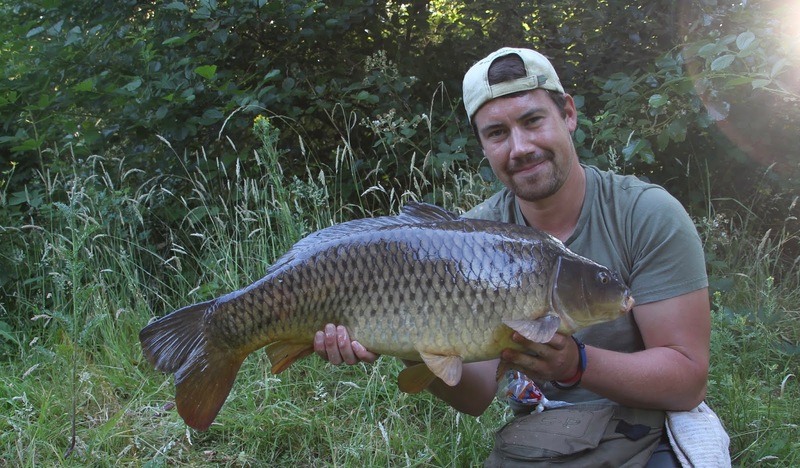 August: For me time got really hard to come by and as a result I fished very little but when I did manage a couple of hours I invariably got a couple of fish to oblige, here is an old friend at 11lb 2oz, funnily its the same weight I caught her at three years ago! Thankfully for her I caught four months previous this time around so there is some progression being made. A big smile, always satisfying to see an old friend. September: This was always going to be very light in terms of angling, after nine months of developing my little angel arrived into the world, with this it was understandable that I didn't get out much. 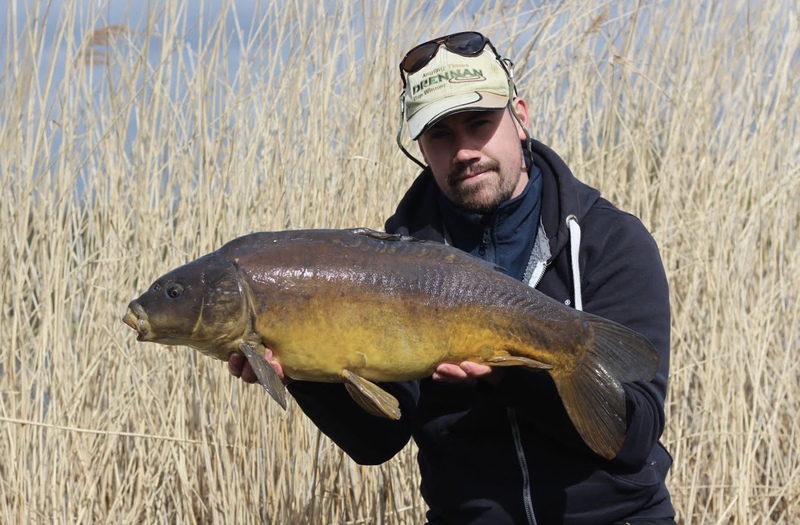 A couple of short visits to my club lake were made but the blanks were beginning to mount up as plenty of angling pressure made it difficult fishing. This mirror probably the prettiest of the fish, although not the biggest. 19lb+ built like a breeze block. This awesome common made a 4am start worth while. October: During this month I managed a couple of trips out, this was for a days fishing on my birthday, 31 years of age and still thoroughly enjoying it. After 6 hours I netted a haul of chub any match angler would kill for, over 200lbs of fish with the best weighing 5lb 6ozs, a day me and my 15ft Greys Toreon trotting rod won't ever forget. The other trips were guiding my friend Yannick who made his way over from The Netherlands to sample some of what we have to offer and it didn't disappoint. Best of a very large haul, emptied the keepnet twice! November: Was spent on the predator front and it was a month to remember where I broke my personal best zander three times in about 30 hours, the first two going 7lb 13oz and then 9lb 1oz. Having witnessed a 13lb 3oz monster come to the boat that evening I found that fire that recently has dropped away a little bit. The result was my third PB of the two days! 11lb 9oz. Awesome! The smile was a permanent fixture for days afterwards. 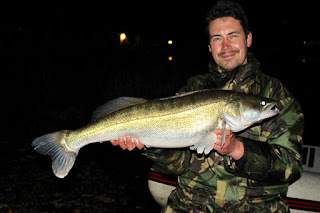 December: Pike dominated the proceedings and I capped off a good month with banking my third river twenty in the shape of a 20lb 8oz beauty, what a fish and I have to say somewhat surprised by its girth. Another half a dozen fish came over this month with most being double figure fish. January: Was much of the same as I continued my predator assault, more pike came to the net with the best weighing 18lb 9oz which avoided a proper photo by ploughing through my net at breakneck speed (thankfully I got a mat shot and weighed her first), these were joined by a few barbel from just a couple of quick fire trips, no less than two doubles were tempted in just 5 hours of fishing over two afternoons, quite a return when you take into account where they came from! First of the two doubles. 10lb 4ozs. A not a bad back up either!!! 10lb 3ozs. Oh and this happened too! 9lb+Bream on a 3-D Roach lure! February: Dace are always in mind when the back end of the season approaches and I wasn't disappointed either, although I didn't catch a pound plus monster this peach of 13oz 00dr made it in to cap off my efforts on the silver dart front. Pike again featured with my best going 16lb 0oz, but the best catch of Feb was a catch of Roach which was topped by a brace of 1lb 14oz and 1lb 15oz, my best two of the season. Best Dace of a brief campaign. March: As work dominated the last month of the season I only got out a couple of times but I came up trumps with a nice river carp, a few chub, a couple of barbel and plenty for me to mull over for the closed season. A plump 5lb+ chub to finish off my season. Not bad at all! For much of the season chub and barbel haven't featured much owing to my non-angling commitments and a winter targeting predators, so with no pressure on myself to catch I went walk-about, no plans to catch anything big, just to wet a net. First port of call was back to the carp shoal I'd found the day before but with the heavy rains the day before the chance of stalking anything had gone as even this reach of the river had been affected. Plan B was to be visited instead to salvage a little something from the day, this was to head on to another river and try for chub, the wind was a challenge in itself as I struggled to present a bait properly. As I begun it was clear to me that it was going to be a tough day, I hadn't even had a bite yet! For probably half an hour I smashed up loads of bread crust and allowed the flow to wash it along the run I decided to trot. With plenty of knowledge of this particular area I moved the float up and down to get the bait in the right areas of the run as a few snags had caught up on the gravel bar alongside a treeline on the opposite bank, this made for tricky fishing combined with the wind. For the next hour I continued to work my bread flake along the far bank before I got that all important dip of the float, "a fish at last" I said to myself as my 15ft Greys Toreon bent double. At no point in my visits here in the past had I struggled so badly, not sure entirely why but a fish was finally on its way into the net. Chub number one safely in the folds of my net. I hoped that would be the beginning of a frantic session having endured 90 minutes roughly of no action. 3lb 8oz roughly, not big but a start and to be fair I was doubting my chances, even the thought of moving had already crossed my mind before the float went under with that one. It took another 45 mins for me to finally realise that the fish either weren't feeding much or they simply weren't there so I packed up and headed elsewhere. Plan C it was then. Another car journey and this time I decided just to chill and have a wander, swapping from trotting to rolling. 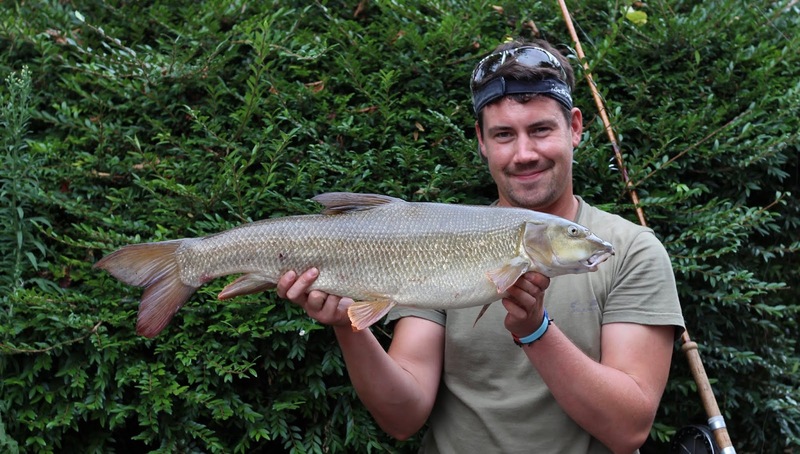 I joined up with Brian for a few hours as he searched for his 100th barbel. For me as I said previously there was no pressure on the last day and just went out to enjoy it, unfortunately the previous two plans went down like a lead balloon so I had hopes for this third and final shot at success. Barbel haven't featured much for me this season which I will put right next season and having targeting them so little this season I fancied a go at one on what was a very good day (in terms of conditions) to be stalking fish and after a bit of toeing and throwing I managed to get a healthy bend in the cane. The sound of the Match Aerial' clutch paying line off is a great feeling and once I had extricated said barbel from the undergrowth the fight lasted all but a minute, not that I cared, a perfect example of a plump winter fish. 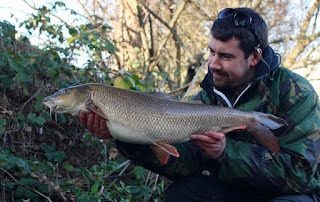 A beautiful stalked winter barbel. Chuffed as you would imagine with that peach we headed off in search of Brian' target where he came up trumps in fine fashion, myself? well I continued to look for fish and having known about a small shoal of chub hanging around an overhanging tree for about a week before this trip I decided to give it a go and wasn't disappointed at all! First cast wasn't particularly good but the second made up for that as it hit the spot required to get a clear run through the area the chub were holding. Just five yards or so into their lair and I felt a decisive pluck on my finger tip which was followed immediately by a wrenching pull on the rod, one of those barbel have grabbed it I thought to myself. However within just a few seconds a large chub battled its way along the outskirts of the tree and showed itself to us both and we knew it was a big one for this river, A certain "Five Pounder"! With the chub now clear of the snags yet really trying to get back in I could enjoy the battle a little more. This fish wasn't about to illustrate how good they can be at escape, determined to slip the net under it I applied a little more pressure to make sure no last moment dashes for cover were made and with my ever faithful ghillie poised to net her, one last thrash was ended as she slipped into the net. Job done, I was pleased with that. My prize awaiting its 5 star photoshoot! The shape all Chub should be ! That Chub was my last fish of the 2018/19 river season and it has been great even with the limited time available, my blogging in turn has taken a back seat too but I'll hope to continue writing frequently as my "100lb challenge" continues into the early Summer. Wet and Wild in the South. The typical dilemmas of where to fish as the season draws to an end cropped up yet again, this time the weather had a part to play and most of the rivers I've angled this season were up and coloured beyond the point of enjoying a good days fishing. The rain that fell in the south-east of England had swollen just about every watercourse, thankfully for me and my local knowledge a couple of spots on one particular river remained fisherable. The target? Basically anything I could get to take a bait! The going was tough to begin with as I started my day out in search of barbel, in the coloured water stalking wasn't an option and I relied upon where they were the last time I was out and that at this time of the year is rather flaky information to rely upon. 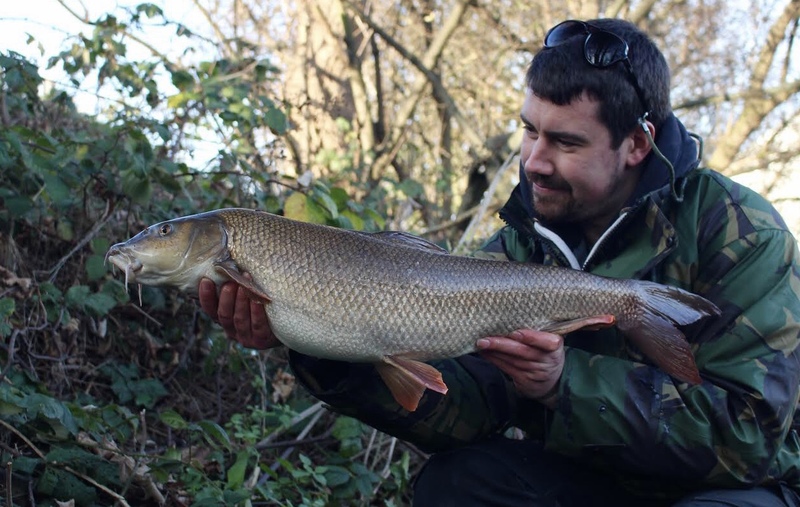 The barbel move incredible distances at time of year as they continue to search out areas where large quantities of food exist and also to avoid angling pressure, which is a factor, even if it is the winter. I spent possibly an hour and half fishing hard before I came across my first barbel and it was fairly decent too as it fought hard in the extra water, around the 6lb mark it made for a welcome soaking of the net as I was fearing that things might not go so well. A dry net is always a barometer of success and although I waited half hour or so for the next enquiry the sport slowly improved as I landed two chub to 4lb 9oz and another barbel around 4lbs. In the conditions I wasn't complaining, then I found enquiries hard to come by so I decided to change species. This sudden change in quarry was prompted by a plume of silt coming from upstream in the flow, I crept up until I found the culprit which turned out to be a small common carp having lunch and out the corner of my eye sat mid river were another three carp, two more commons and a mirror, these were all a little bigger and that is what tempted me to have a go, armed and ready I began to roll little pieces of bait towards the carp to see their reactions and it seemed none of those were feeding. It was time to play detective! It was quite clear from the offset that they weren't feeding out in mid river so it was a case of waiting for the carp to venture back into the margins, this turn of event didn't take long either as one of the carp broke away from the main flow the rest followed and with a little watercraft I was already in position where I thought they'd come to, it was all now a matter of when, not if. The mirror dropped off behind the now three commons and came in closer to the near bank margins, just 10ft from where I was crouching, concealed by a small bush I flicked out my tiny free lined offering and awaited it to settle where I hoped the carp would find it, there was however no need to panic, within a few seconds of the bait hitting the deck the carp made up the ground and went straight down on the bait, hoovered up in a flash there was no need to wait for any indication, I lent into the carp with trusty mark vi split cane and then all hell broke loose. The remaining carp scarpered but I had certainly hooked the largest of the four fish. Plenty of under the tip battling with the occasional run for mid river was enjoyed thoroughly and within a few minutes of getting in position I landed a boisterous river carp in fine fashion. Not bad really considering how tough it started out. A little opportunism was taken with both hands. 11lb 2oz and bit of a looker too! I have to say I have caught many river carp over the years but this is definitely one of the easiest on the eye. After that I managed one more barbel to the tune of 7lb 3oz and that was that for me as I'd said to myself that I would only fish up to midday, three barbel, 2 chub and a carp in 4 hours in squalid conditions is good enough for me!